Great location and spacious apartments. Swimming pool has stunning views of Copacabana Beach. The location is fantastic, in front of the beach of Copacabana. The upper floor has a pool and a bar with an outstanding view to the beach and surrounding mountains. Very helpful front desk staff (especially afternoon shift - don't forget you have that couch in Canada).. Breathtaking views from rooftop, great pool, delicious caipirinha.. The best DJ and music in the area on the weekend nights! Very central location in Copacabana..Rooms were spacious and clean, breakfast buffet had a wide variety of food.. The staff really has the attention to details: from greeting you by name to giving tips for a lovely city walk to organizing a transfer to Paraty! Thank you!! Next to that comes inevitably the roof top bar! What an amazing view over the city of Rio! The room was clean and cozy, perfect for a lazy sleep-in on the weekend. Lovely hotels with beautiful views from the rooftop terrace. Nice swimming pool. Very relaxed atmosphere during the day. Very friendly and helpful staff who speak great English. The hotel is in a perfect location, right in a middle of copacabana beach and there is lots restaurants around the hotel to choose from. There were mainly couples or group of friends and families though and not so many single travellers. wonderful rooftop. Pedro from the hotel staff was very attentive to us. The pool and views from my room (ocean view suite) were very nice. Huge balcony. Great location on Copacabana Beach. Good drinks at the pool bar. I liked the property itself, but staff was very bellow expectations. Great location, friendly and helpful staff (good English) clean rooms , nice roof top with a great view , good value, good breakfast. Very good breakfast with a huge variety of food. The restaurant and bar staff were nice to us! The rooftop was pleasant to stay and we enjoyed the pool area. The view of Copacabana beach is amazing! The location is very good, in front of the beach and lots of shops around the hotel. Room was comfortable and quiet. We had a great time with our family with two small kids! Pestana Rio Atlantica This rating is a reflection of how the property compares to the industry standard when it comes to price, facilities and services available. It's based on a self-evaluation by the property. Use this rating to help choose your stay! One of our top picks in Rio de Janeiro.Located on Copacabana's stunning beachfront, Pestana Rio Atlantica offers modern, luxurious suites and various leisure and gastronomic options. The rooftop pool and lounge bar offers panoramic ocean views and sophisticated cocktails. Free WiFi is also available. Each of the rooms is fitted with a private balcony with city views, air conditioning, a flat-screen TV with cable channels and a mini-bar. The private bathroom includes a shower and free toiletries. Some suites also include a spa bath. Guests can sample fine Portuguese cuisine at the restaurant. A breakfast with buttered croissants and juices is served on the restaurant. The spa offers essential oil massages, and guests can use the modern gym. The environmentally sustainable Pestana Rio Atlantica is conveniently located 5 mi from Santos Dumont Airport, and 12 mi from Galeao Airport. Christ the Redeemer Statue is 2.5 mi away, while Copacabana Fort is 1 mi from the property. Copacabana is a great choice for travelers interested in beach walks, sightseeing and sandy beaches. This is our guests' favorite part of Rio de Janeiro, according to independent reviews. When would you like to stay at Pestana Rio Atlantica? Footage of 98 ft², accommodate up to 03 people (third person in extra bed). Located without sea view. 32 "cable TV, magnifying mirror, safe, telephone and hairdryer. Private parking is available on site (reservation is not possible) and costs BRL 35 per day. Side sea view. Footage from 17 to 66 ft², accommodate up to 02 people. 32 "cable TV, magnifying mirror, safe, telephone and hairdryer. 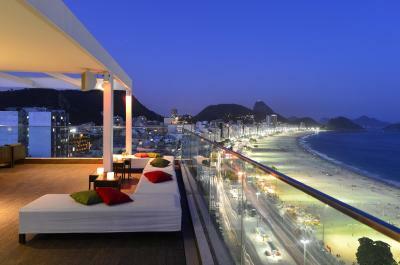 This Ocean Front Suite features a large 46 ft² balcony with panoramic views of Copacabana Beach. Footage of 56sqm. Accommodates up to 03 adults or 02 adults + 02 children under 12 years old (third and fourth people accommodated in extra bed). All rooms have a bathtub. 32 "cable TV, DVD, Ipod and Iphone deck, magnifying mirror, safe, telephone and hairdryer. Side sea view, to the Copacabana Fort or the Leme. Footage of 98 ft², accommodate up to 03 adults or 02 adults + 02 children under 12 years old (third and fourth person accommodated in extra bed). 32 "cable TV, magnifying mirror, safe, telephone and hairdryer. Side sea view, for the Copacabana Fort. Footage of 98 ft², accommodate up to 03 people (third person in extra bed). All rooms have a hydromassage bath. 32 "cable TV, magnifying mirror, safe, telephone and hairdryer. Footage from 17 to 66 ft², accommodate up to 02 people. 32 "cable TV, magnifying mirror, safe, telephone and hairdryer. 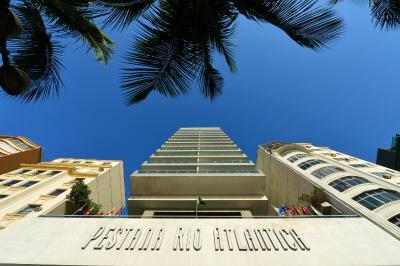 Guests of Pestana Rio Atlantica, one of the most emblematic hotels in Rio de Janeiro, will find a perfect hotel for all kinds of tourists, from those who wish to enjoy the beautiful beaches to those who care about culture and sports. Hotel surroundings – This neighborhood is a great choice for travelers interested in beach walks, sightseeing and sandy beaches – Check location Excellent location – show map Guests loved walking around the neighborhood! House Rules Pestana Rio Atlantica takes special requests – add in the next step! A BRL500 damage deposit is required on arrival (around USD126.45). This deposit will be fully refunded at check-out, as long as there isn't any damage to the property. Pestana Rio Atlantica accepts these cards and reserves the right to temporarily hold an amount prior to arrival. Please note that at the time of check in the hotel requests the credit card as guarantee of payment of postpaid reservations and consumption during the stay. In accordance with Brazilian legislation (art 250 ECA) children under 18 years old are prohibited from reserving or occupying hotel rooms without parental consent or presence. At check in, children without parental presence must present an authorization signed by both parents and original identification documents. In the case children are accompanied by parents, original identification documents are required. Please note that for nonrefundable rates, it is mandatory that the credit card charged during the reservation is shown upon check-in. In case it's not possible, the total amount of the reservation will be charged again on a new credit card or alternative form of payment. In this case, the amount charged previously in the credit card provided during the reservation will be reimbursed. Third-party credit cards are only accepted if guests contact the hotel previously requesting for a pre-authorization. Private parking on-site is subject to availability and surcharges. Please note that extra beds can be provided only in the Suite category. Please contact the property for further details. Please note that an optional tourist tax is charged per room/per day. Please contact the property for further details. The hotel has a lot to offer, but certain areas could use a refurbishment, like the spa area. Great location right on Copacabana beach. Friendly staff and decent breakfast. The room was not very clean and the receptionist staff was not good. I think nothing. If I really wanted to comment on something that troubled us a bit was the slow elevators. But was manageable. One of the hotels in Rio - Copacabana. Location and rooms were absolutely awesome. We stayed in a family suite - 2 adults as 2 children, both below 10 years. The nearest metro station, Cantagalo is around an 8 minutes walk. . The Copacabana beach is just across the road and the walk alongside the beach can be done on either side to view the and click memorable pics of the wonderful sand-art. Lots of locals selling off different types of things. Must compliment the reception staff for their real helpful nature and attitude. Especially would like to compliment and thank Jose for ensuring our stay was made pleasurable. He's helpful and always smiling no matter the number of questions you throw at him. He is always ready to assist in every way possible. All other staff speak English too and are quite helpful. I must say and recommend this hotel for all those who are looking out for a hotel in Rio. The pool and deck area is wonderful and has beautiful views from the top. Plenty of restaurants, supermarkets, souvenir stores, pharmacies. All along walking distance of 5 minutes. Thank you Pestana Rio Atlântica, for the great experience and being part of our dream travel destination. Excelent location and confortable room. Very good shower!! My room was muggy, never felt like the ac was running.. the bathroom was filthy, the curtains were dirty and there was no bedsheet on the mattress. I liked the staff and how helpful they were! Room very Small, cupboards tiny, Beds very hard, old and dirty furniture! Breakfast buffet Not enough for the amount of people at already 9.00 hrs!! We checked out after one night and changed hotel! View from the Roof Top! Not all staff is friendly and nice. Room was poorly maintained and some features did not work properly. Also not clean as one would expect. Old towels. Very poor breakfast. Location and pool at the top. The hotel need better maintenance as some rooms have infiltration and air conditioning leaks. Also could improve breakfast food and drinks. The food is good but it's overpriced. On booking.com, it says the hotel offers an airport shuttle service. One piece of advice to future guests if arranging this via email: allow a lot of time before your stay as the hotel staff were not very fast at replying and they didn't send any confirmation. This meant we didn't know if someone would be waiting for us at the airport upon arrival, or not (luckily they were). Upon departure, we requested the same airport shuttle through the hotel (with professional driver), and the hotel staff said they would organise a normal yellow cab for us. If a hotel is advertising that they can provide an airport shuttle, then they should be able to fulfil this expectation for their guests. We had a room with balcony overlooking Copacabana - the view was unbelievable. We loved the rooftop with the pool and the food was good. Special thanks to Pedro at reception for always helping us with any requests. Room are a bit old. The elevator were broken long waiting time to move up and down. The room need repair fast. The breakfast was pretty good. I like the location. Average breakfest. Litle selection. No vegatables. Queue for omlettes. Constant problem with lifts availability. Location. Clean. Friendly staff. Great roof tarace with bar and swimming pool. Probably the reception toilets - but we’re not brutal. The room was very clean and comfortable. When we arrived it’s was 5am and the reception staff person was not the most welcoming (I guess he had completed a night shift and may have been tired) but I didn’t feel excited that it was going to be our home for the next 5 days, it’s the first impression of a place which is the most important. I think if we had not booked already we would have went elsewhere. BUT later in the day we checked in with a lovely guy called Pedro who absolutely made us feel at home. He pointed out everything positive about the place and location. He’s worth gold to an organisation like this and we thank him for making our stay very special.